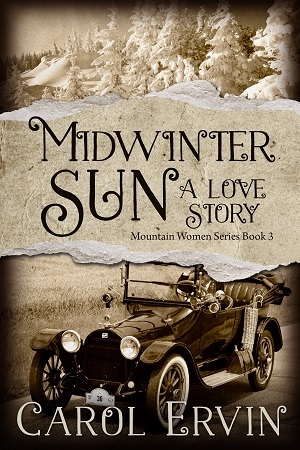 Readers who loved May Rose’s story will be happy to discover her new adventures in the final story of the Mountain Women Series. It’s Midwinter Sun: A Love Story. The characters are older (and wiser, a condition which always happens, we hope). They’ve returned to Winkler, West Virginia, where everything has changed. I’ll put a sample chapter on this site soon. The print version should be available later next week. Meanwhile, you should be able to sample chapters on Amazon. I’ll be glad when you’re writing again! I read the first book in this series, and now the last book of 3 is out. Wow, what a ride. Carol Ervin is truly an “awesome indie.” What beautiful covers, and her writing is incredible. Looking forward to “Midwinter Sun”.